Sugar producer Tate & Lyle is set to return to the FTSE 100 after a seven-year absence from the shares index. Based on its Tuesday closing price, Tate & Lyle will re-enter the stocks' top flight when the quarterly reshuffle comes into effect on December 20. Tate's shares have leapt 55% this year, boosted by firming sugar prices and sales of its artificial sweeteners. It will replace engineering firm Tomkins, which has seen its market value decline over the past quarter. Inclusion in the FTSE 100 is seen as a mark of prestige and more often than not, raises a company's profile among investors. Tate ranked as Britain's 90th biggest company at Tuesday's close, while Tomkins ranked 110th, the smallest member in the blue-chip index. The engineer will be relegated to the FTSE 250 index. 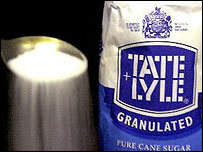 Tate & Lyle, an original member of the historic FT-30 index in 1935, was ejected from the FTSE 100 in September 1997. The company's history dates back almost 150 years to Henry Tate's sugar cane refining business in Liverpool, which merged in 1921 with Abram Lyle's golden syrup firm. Roll forward to today and its popular sugar-substitute Splenda is selling strongly at a time when more and more people are trying to cut down on their sugar intake for either diet or other health-related reasons.